Receive FREE shipping on your entire order when you purchase this item. The Silver Series optics are the heart of our lineup. The trusted optics that have built our reputation through the years. Although many SLx optics will be familiar to Primary Arms fans, we are always pushing forward with new generations and adding even more options in response to the demands of our loyal customers. 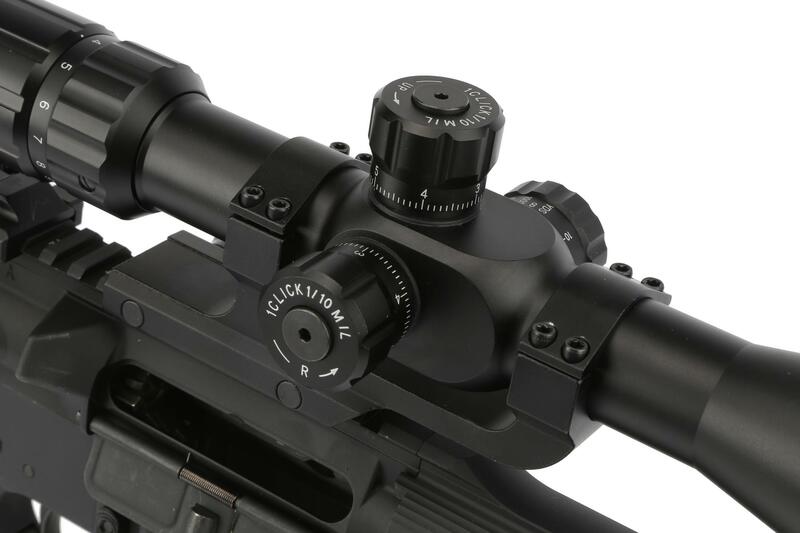 The Primary Arms 4-14x44mm rifle scope was our first step into first focal plane (FFP) optics and remains one of the most cost-effective options on the market. Having a reticle stay 'true' through the entire magnification range opens a world of possibility for hunters, marksman, and competitors everywhere. 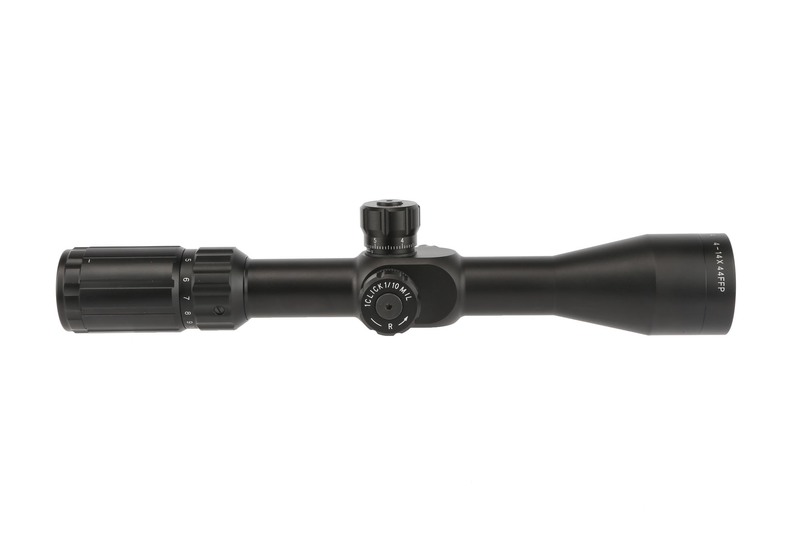 Add in "built like a tank" construction and a 3-year warranty, and it's easy to see why this scope is so popular. Parallax adjusts from 15 yards to infinity! 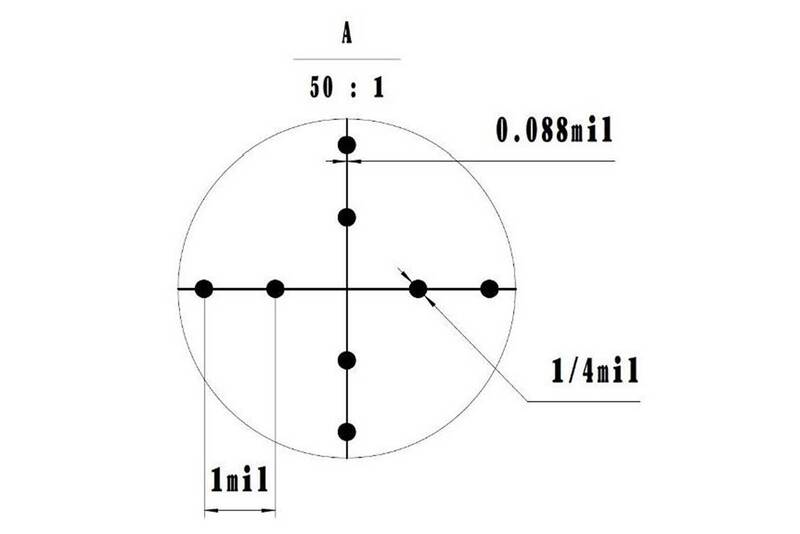 At the heart of the 4-14x44mm rifle scope is our first focal plane MIL-DOT reticle. 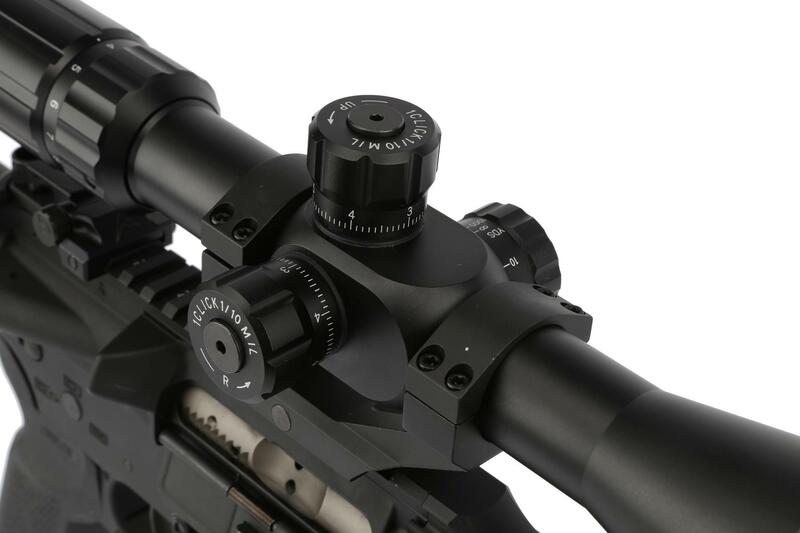 Properly matched with MIL/MIL turret adjustments, this traditional reticle in use by military forces in almost every country allows shooters to range and find their hold overs without being forced to use caliber specific BDC systems. Each dot is .25 MILs with a full MIL measured from the center of one dot to the next. 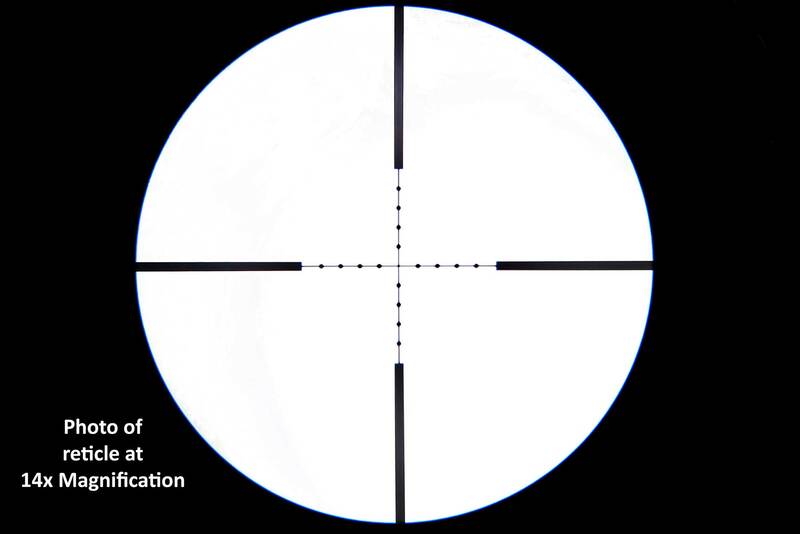 For shooters who want a proven reticle with wide spread military acceptance, the MIL-DOT is perfect for you. 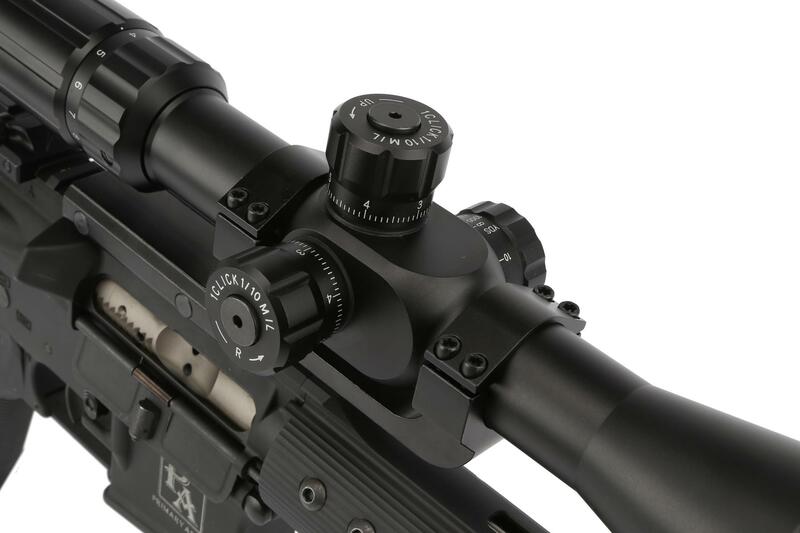 A scope that won’t hold up to real world use won’t do any good, so we built our 4-14x44mm FFP tactical rifle scope to last with a heavy-duty aircraft grade 6063 aluminum body and 30mm main tube. 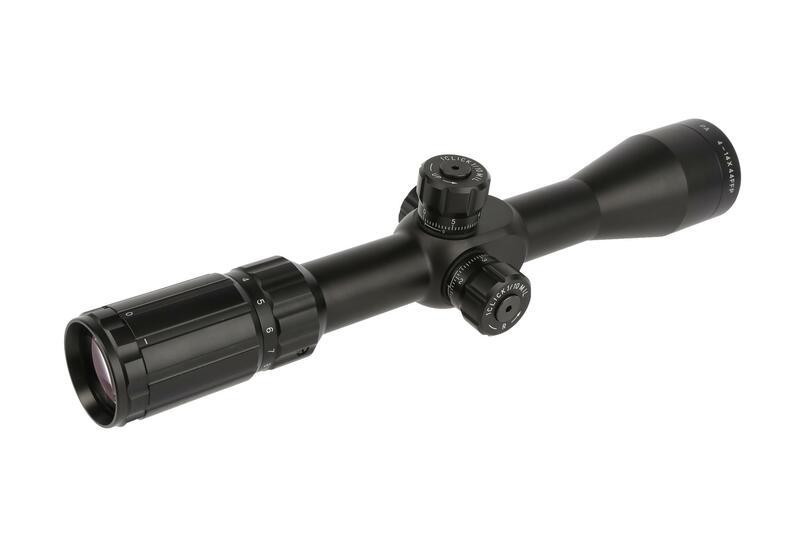 Waterproof, shockproof, and fog resistant, this scope is perfectly at home on an AR-15 or your favorite hunting rifle. Even better, the MIL/MIL turrets track correctly through their full 17.5 MIL adjustment range, allowing for confident adjustments for shooters who prefer to count their clicks. 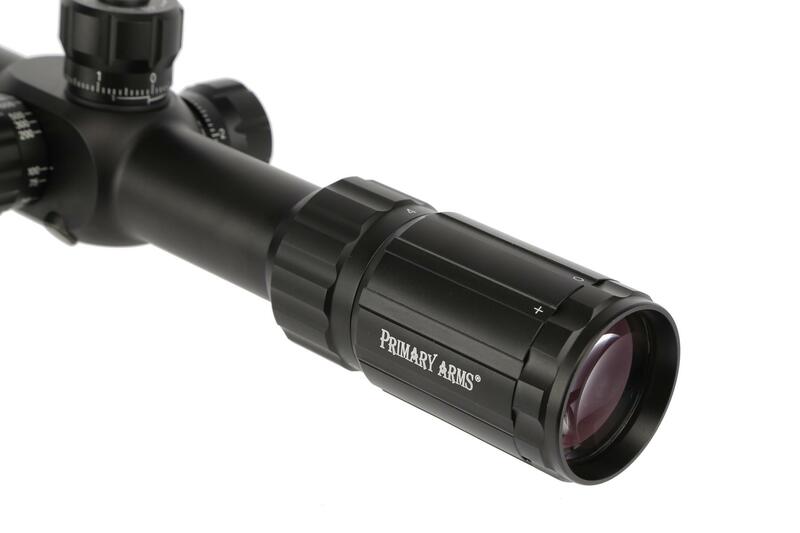 With clear glass, heavy duty construction, and a true first focal plane reticle that can be leveraged at every magnification, the 4-14x44mm rifle scope from Primary Arms offers shooters a versatile and effective rifle scope, covered by our 3 year warranty! Great scope for the Money!!!! First day i got the scope, i used a bushnell bore sighter and set it out 75 yards at night time. Next morning I shot the 50 yard target 3 times, 1/4" grouping. Took it out to 100 yard, shot once, adjusted scope and hit dead center the rest of the day. The first focal plane is a deal beaker for me. It has a resettable zero turret. I'm impressed with the clarity. Their scopes should be in big box stores. These should be replacing several big brand names except for Vortex because of the lifetime Warranty. It came with dust covers and the tool to ajust zero turrets. Only drawback is how hard it is to turn the Zoom. If it had a handle to ease the turning. I would buy more of these. 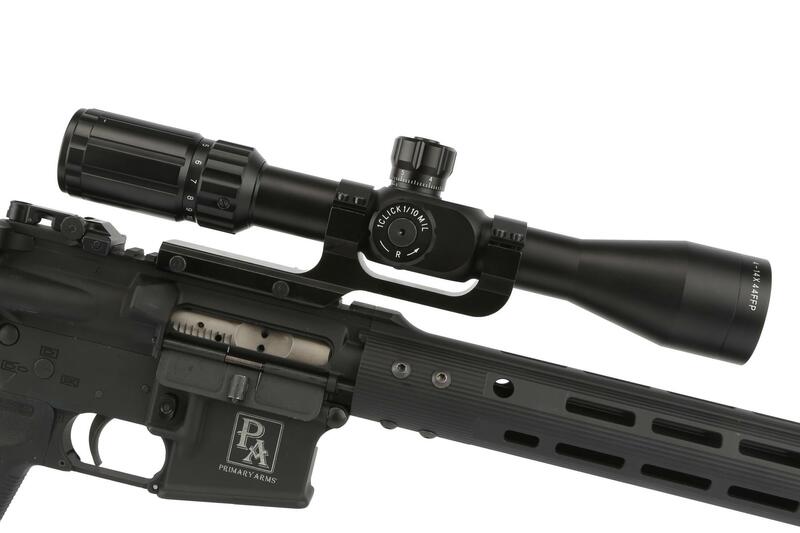 Great price, great scope. The 14x clarity beat out my 6-24x scope. The eye relief could be better but it does what i want it to do. Hold zero. I didn't care for illumination on the crosshair, so i choose this model for that particular reason. Bought this scope to replace the cheap factory scope on my Remington 783 in .308 and this PA scope is money! With the factory scope I couldn’t hit anything past 200 yards and was worried I bought a dud. I had this PA scope professionally mounted and went shooting in lovely 36* wet raining weather with 8-10 mph winds. And this scope performed great! Rang steel from 300 out to 935 yards. Thank you PA for another great product! Decent scope for the money. Only one problem, crosshairs are crooked. Most likely will return it. Quality for any Price point! I actually purchased this unit second hand (But it was new). I already have the ACSS version, and wanted to Mil Dot version in order to do a comparison, as well as having dreams of reaching out to 1000 yards, and using a Mil Dot has proven to be easier to use when getting the kinds of Instruction I tend to get from Prior Mil/LEO. <br>It will be very hard to find Glass quality equal to the PA offerings in this price range. I found the turret use to be straightforward, but the feedback when making adjustments was a little lacking. I guess the term spongy or mushy would be the term I would use for the "Clicks". The adjustments were exactly as they should be, you want to make a 1 MOA adjustment, you turn the knobs and it will be the adjustment input. Great Product at a great price. Combine this unit with a quality mount, and you shouldn't have any complaints. FOr my testing, I have it installed on a Midwest Industries 30mm QD Scope Mount. Solid Combination. Excellent price, even better Optic. I bought this as a budget optic for a Ruger American Predator in 6.5 Creedmor with a 22” barrel. So far I’ve been loving it. I’ve but well over 100 hundred rounds through the rifle. 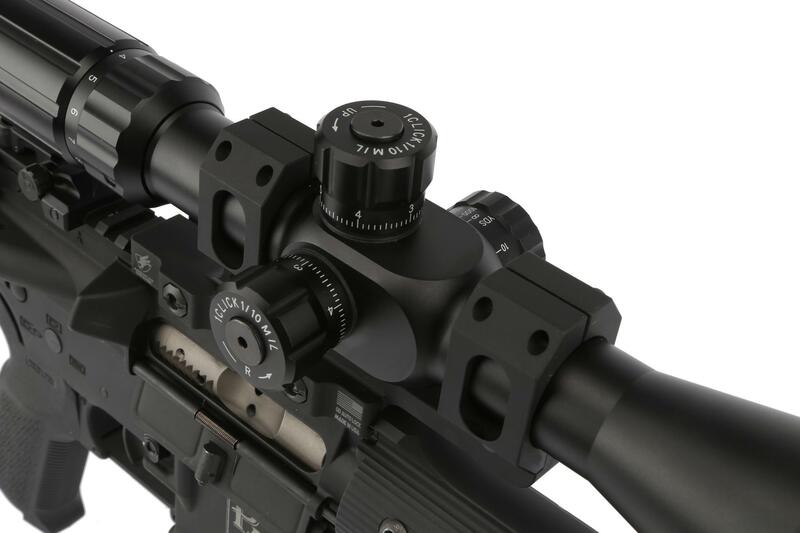 I have this in a pair of the new UTG Pro Precision Rings (which are just as nice as my Seekins rings but only cost $50) and mounted on a 20MOA EGW mount. The optic itself is very clear even up to 14x and with Hornady Black 140gr ammo I’ve been able to make 1 MOA or better at 300 yards. I use the Ballistic AE app for my calculations and honestly for a $230 optic on a $400 rifle, I couldn’t be happier. I’m very confident this scope will work for you to 1000 yard distances. Great optic as a whole, the only problem I had was with the turret. After a couple of months the turret would not stay on zero and has a little play in the dial. I still plan on getting a new one as soon as deer season comes around. All around just a great optic !!!! Possibly the Best Budget Scope Available! 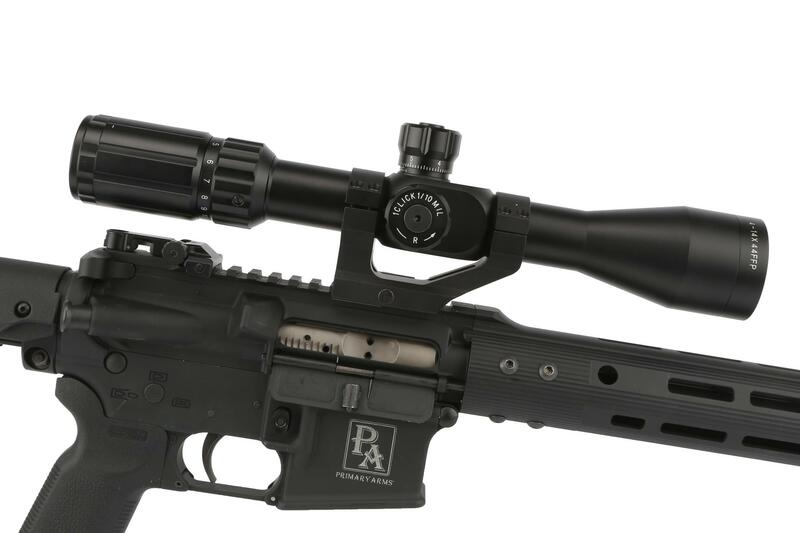 I purchased this scope (with the discounted PA cantilever mount) for a SPR/DMR-style AR build. The first one I received had some issues with coming in and out of focus under recoil or impact (even dropping the bolt would cause it to shift in and out of focus), so I contacted PA with my problem. They responded quickly with a return shipping label and had a new scope to me in under five days total after determining that the scope was defective. <br>Now that I have the (100% functioning) replacement, I have to say that I couldn't be happier. 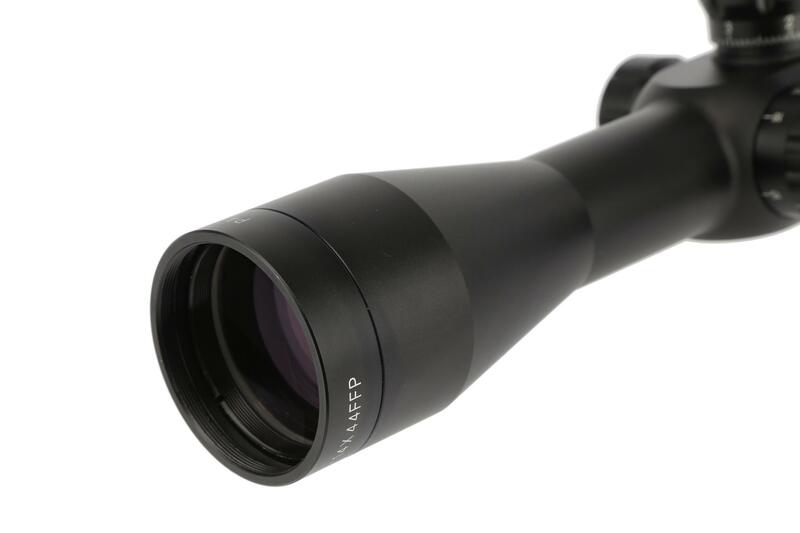 Outstanding clarity and function combine to deliver possibly the best value in FFP scopes extant. Holds zero all day long, clicks are extremely audible and tactile, and it passes the box test with flying colors. 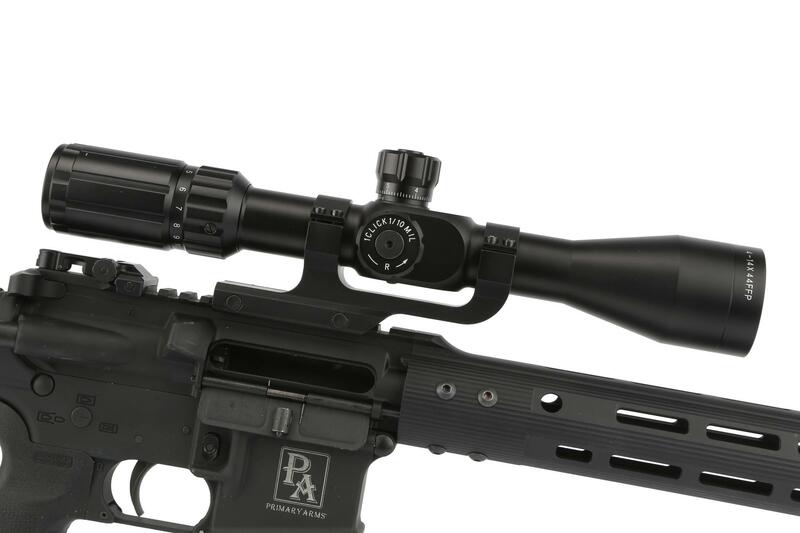 Relative to cost, this scope overdelivers like nothing else on the market. <br>Top marks for both the optic itself and Primary Arms's customer service and willingness to stand behind their products. Best $230 I ever spent. Five stars for value for your money and features. I bought a second one and am back for a third one. You can spend twice this amount on another brand of scope and get far less in features for twice the money. Hands down some of the best customer service in the industry! I ordered a 4-14 FFP mildot optic nearly a year ago for a a build that was in the works. I finally finished the build and never got range time until recently when I discovered my optic had debris on the back side of the eyepiece that was large enough to cover the cross hair and affect target acquisition. 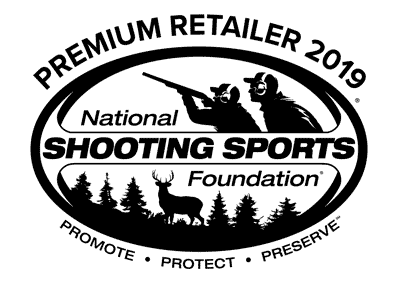 I contacted primary arms customer service department nearly a year after the purchase date and explained my problem.Melissa quickly responded to my return and had a shipping label to me in a timely fashion. I sent the optic back and was informed it was beyond repair and that I had a new optic on its way to me in the mail. This company goes above and beyond to keep its customers happy and have just won themselves a customer for life. Thank you Primary Arms! I took this scope out to South Dakota for a little prairie dog action. The scope worked extremely well. The clarity was great. It was very comparable to my buddies' $1000+ scopes. This was my first time ever shooting over 200 yards and I was able to dial in and consistently hit a 778 yard target with my 223. All of the adjustments seemed to work very well. 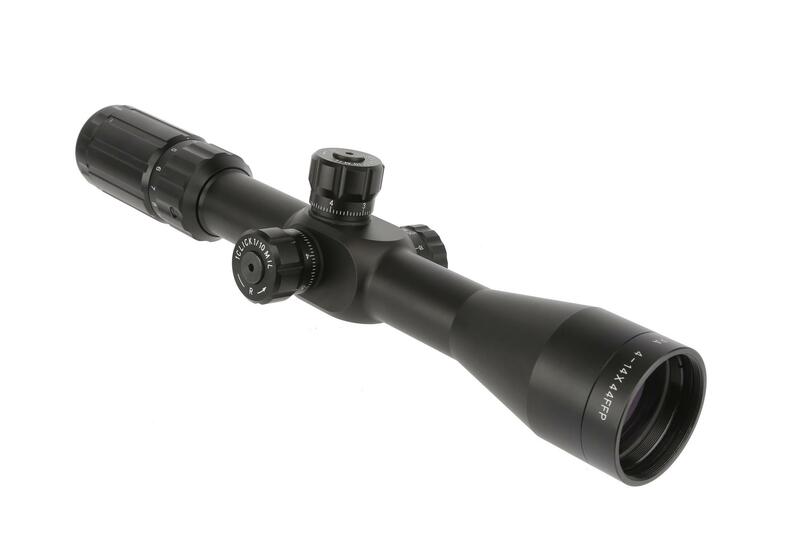 The turrets are a bit mushy like the other reviews say but you can't expect perfection in a scope for under $250. 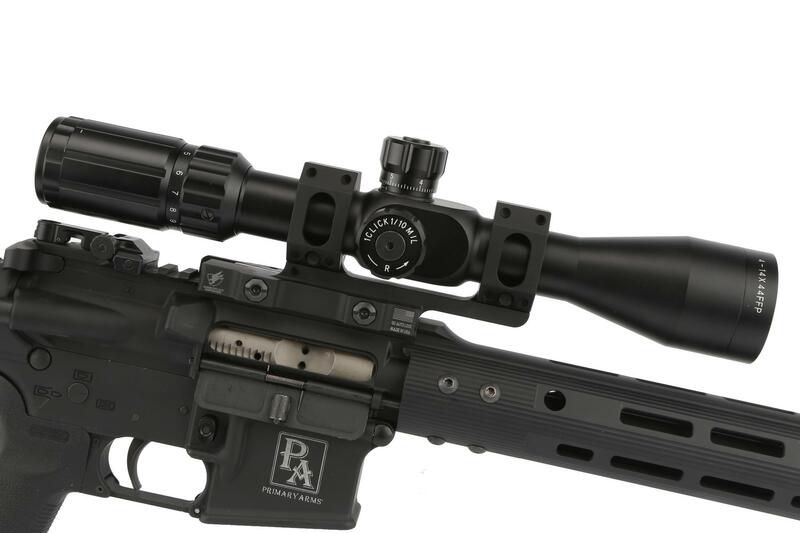 The only question I have is can you PLEASE PLEASE PLEASE start making a higher power version of this scope (maybe a 5-20 or 6-24)? I need a new scope for my 6.5. Second scope bought from PA holds zero shooting under 1/2 groups. Buy one you will not be disappointed! I am running this scope in a DNZ 20MOA tactical mount on a Howa 1500 in .300 Win Mag and have over 200 rounds through it with no issues. The rifle has a brake and some weight added in the stock to help tame recoil but it's still a beast. Ive taken taken this combo out to 1100 yards and it was ringing steel like a champ. It just keeps running flawlessly. My only major gripes are the turrets feel a little mushy and the tick marks on the turrets don't quite line up with the zero marks on the scope body. 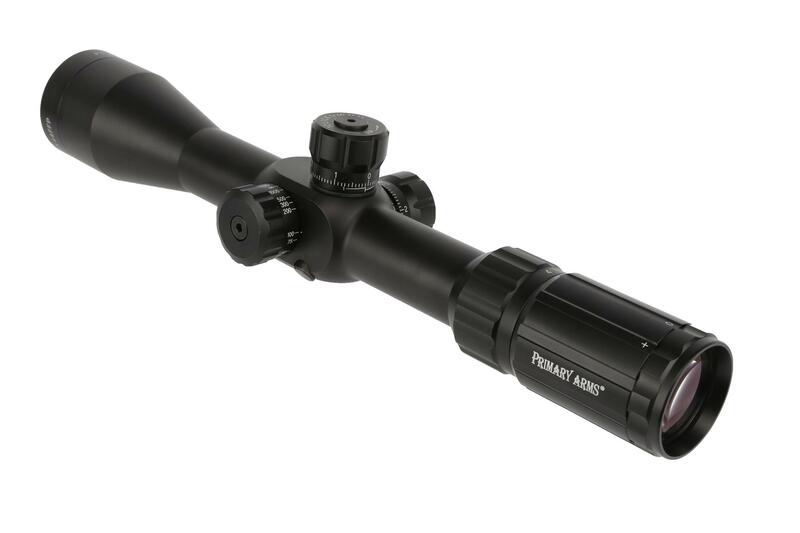 So it's no Nightforce or Swarovski but it's a damn fine scope for the price and even better than some twice the price. I like it so much I put a second one on my AR-10. Honestly I haven't used the scope enough to review it. HOWEVER... I had an issue with the scope after 225 rounds. I called Primary Arms told them about the issue. I was sent the information to return the problematic scope. I took it to UPS and sent it back ... shipping was paid by Primary Arms. When I returned home from the UPS store ... they had ALREADY DELIVERED THE REPLACEMENT SCOPE. I mean seriously wicked good Customer Service. If I could give them 6 stars ... I would. Had this scope on a 20" AR for over a year and moved it to a .308 bolt gun and it has never missed a beat. I constantly get sub moa out of the scope and gun and everyone that shoots it is amazed at the clarity and how any gun/scope combo can consistently get sub moa out of 147 NATO ball. Super clear glass that I can see the paint chips from the steel target at 300 yards and even went 5 for 5 on the 2" square at 300 yards. I won't be replacing the scope anytime soon. Also the customer service is always excellent and very intelligent. I bought this scope mainly out of curiousity of a FFP costing $230. I had to take a step back and look at the bigger picture before I reviewed this scope. It didn't really compete when I put it against my high dollar Vortex. Taking the price point into consideration this scope is well worth the money. The first thing I noticed was the mushy turrets. Very audible but mushy. Optics are clear and sharp with good light transmission. I'd compare the glass to that of a Nikon. The scope tracks excellent. 0 issues there. The cross hairs are a little thick but not overbearing or intolerable. 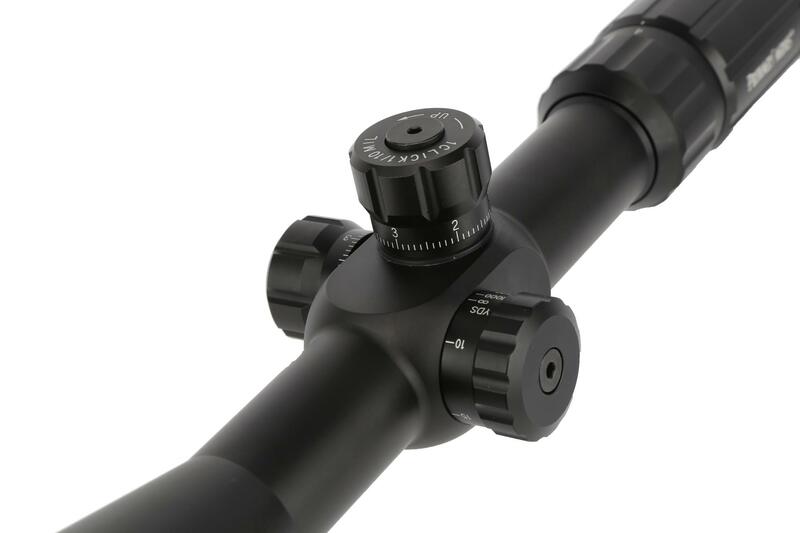 As far as getting what you pay for this scope is well rounded for the price point and in my belief could easily have a slightly higher price tag and be worth it. For a budget build or a entry level shooter you won't go wrong by purchasing this scope. 5/5 stars to PA for their customer support also. 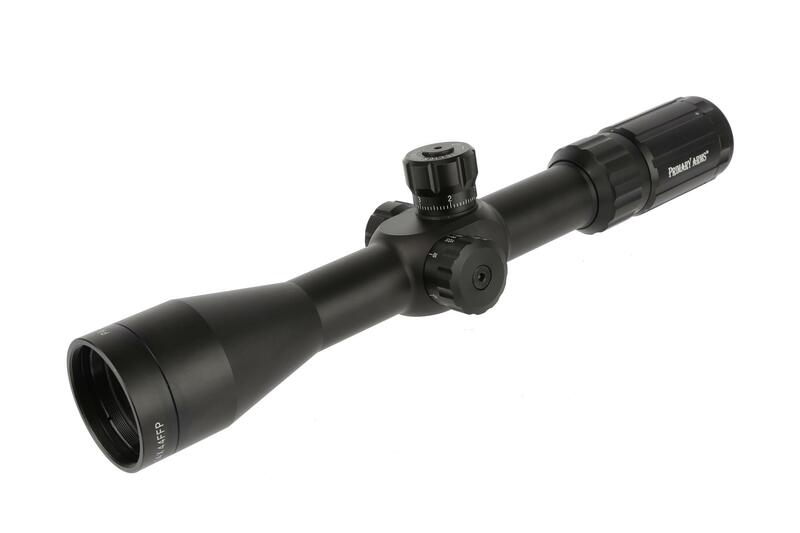 Was looking for a budget mildot scope for a Ruger American predator 6.5 Creedmoor and overheard a fellow mention "Primary arms" so o i did a little research and purchased the 4x14x44 ffp. The shipping was fast and the scope so far has been amazing! For a $400 gun and a $230 scope im getting groups in the .3's! Great product! Hopefully it has great longevity! Keep up the great work P.A! YOU CAN'T BEAT THIS SCOPE FOR THE PRICE!! I own a decent Nikon Prostaff and the clarity between the two is unnoticeable! The glass is very sharp and crisp from 4x-14x! No graying out or any of that cheap scope kind of stuff here. Plenty of MOA adjustment and zeroing was a breeze! The turrets have a slight and I mean slight mushiness to them but not a problem what so ever.The crosshair and mildots are standard and work well. Tracking was also great! This scope is on my custom built 6.5 Grendel AR long range rifle. If Dimitri can get a 6-18x or 6-24x he's got me sold! Keep up the awesome work and products Dimitri!! I got this cause the price to put on a 22LR. The turrets will not line up with the marks at all. Thats a big problem when taken the 22 out past 100yds like i like to. You have to recall if it was before the "0" or after. Glass is good turrets are alittle stiff.